How to draw customers’ attention and orient their action toward specific goals is one the biggest concerns of any web owners. Then, what you need is Magento 2 Popup extension that allows admin to design any image popup as wish including sales promotion, newsletter subscriptions, contact form, or cross-sell product popup, etc. The limitation of creating Popup in default page. Magento 2 Image popup is used as an eye-catching call-to-action button which is one of the most frequently used methods to boost marketing strategies on websites, especially e-commerce ones. However, the default doesn’t support creating the popup. Thus, to meet the need of web owners to take advantages of banner popup to advertise their sites, as well as increase connection with potential customers, BSSCommerce would like to introduce Magento 2 Popup extension to expand admin’s ability to create all popup types for specific objectives, such as sales promotion, notification, newsletter subscription, or guideline. Although customers usually find image popup annoying as it may disturb them from shopping or reading online, surveys have shown nearly 1,000 % increase per month in newsletter subscriptions on sites resulting from displaying pop-ups. Magento 2 Popup extension is exactly a useful tool for you to achieve such an impressive figure. Admin can freely create and customize different types of popups to convey messages to customers, such as promotion popup, newsletter popup, popup contact form, and so on. 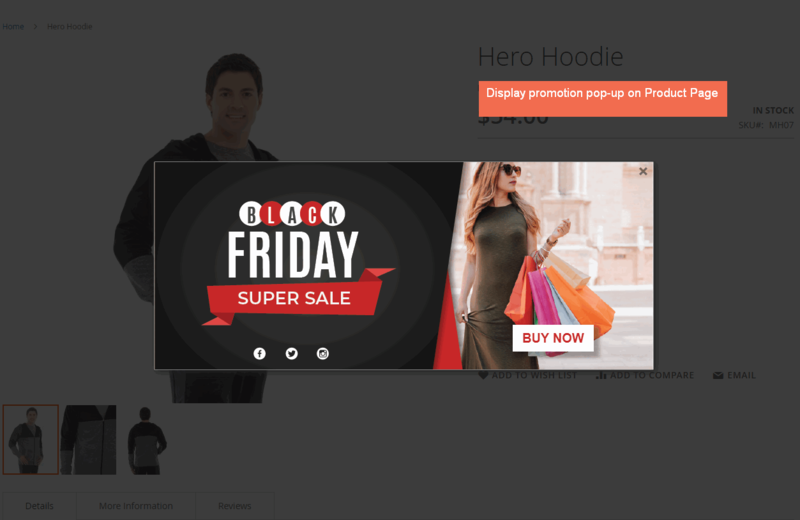 This Magento 2 promotion popup extension is an advanced way to capture customers’ attention then call them to act as your goal, as well as support your marketing strategies. For web visitors who used to be fed up with annoying image popups now become more comfortable with the informative, timely and well-designed popup. Let’s explore it to find out how image popup can renovate your online store and support well product marketing. Easily create and customize any popup types: promotion popup, newsletter popup, cross-sell popup, image popup, contact form popup, image popup, etc. Magento 2 Popup extension enables admin to create unlimited image popup, customize the design and content for those popups, as well as use different rules to display each popup regarding customer groups, customer behaviors, or store views. Another convenient feature is flexible setting time, a valid date for automatic closing or adding animations of promotion, newsletter subscription, contact form, or cross-sell popups. Popups surely support marketing and increase sales and subscribers on site, however, where and when to show promotion popup or newsletter popup is vital to avoid annoyance for visitors. This problem can be solved partly with Popup extension’s feature allowing popup on all pages with various positions: top left, top right, top center, middle left, middle right, and middle center. 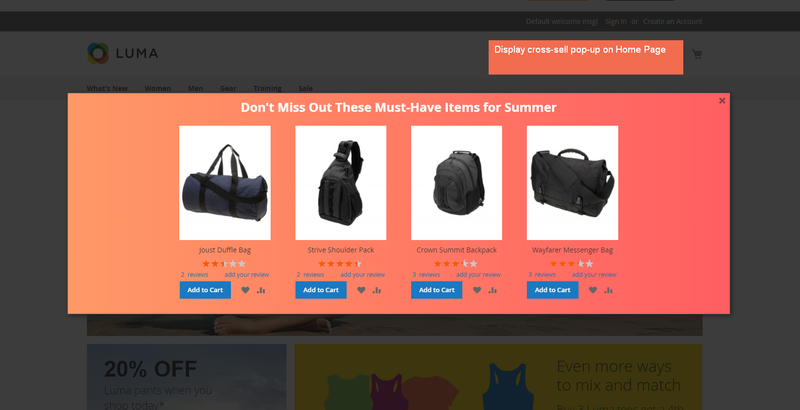 Restricting each type of popup to specific customer groups and store views truly help you to access targeted visitors and support marketing more effectively. You can try this wonderful feature in the backend setting of this extension. Popup for Magento 2 extension helps admin to customize their popup with custom CSS and WYSIWYG editor which allows creating content, inserting videos and images, or widget on the banner popup. For a more attractive popup, you can make use of the following wonderful effects supported in the backend admin: Zoom. Move from Top, Zoom-out, Horizontal Move, and 3D Unfold. Online visitors have short attention spans to subscribe or submit information because they’ve been distracted or you don’t have a clear and appealing call-to-action button. Thus, give Magento 2 Popup extension a try to interrupt they’re leaving, then redirect them to product pages to order hot deals, or put Magento newsletter popups for more subscriptions, set image or video popup to promote new items, show contact form popup to gather feedbacks. This Magento 2 promotion popup extension is supplied with FREE Installation and FREE 1-year support. The support team is willing to respond to your questions at all time.